Last week I remembered I had a Pinterest Board titled Recipes I need to Try. I've been pinning away to this board with good intentions, but somehow I never seem to get back to it. Pin 'em and forget 'em! That's what I do! It's the thought that counts, right? While I was scrolling through looking for inspiration and salivating over all the beautiful pictures, I was stopped in my tracks when I came upon a picture of stacked deliciousness! I didn't really know what it was. I was a little confused because it had what looked like a brownie on the bottom and chocolate chip cookie on the top! This is a thing?? 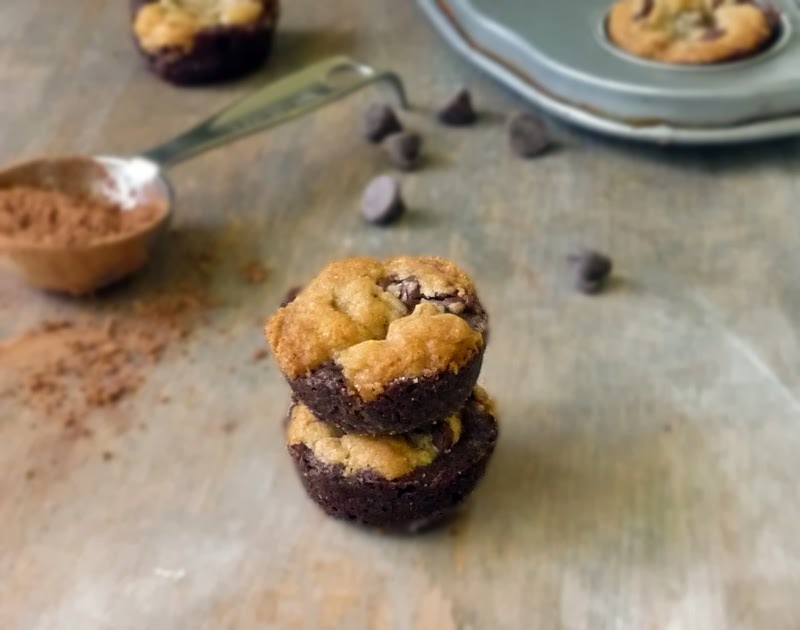 My AHA moments are on some sort of permanent vacation, so it took me a minute (or 5) to realize I have a great chocolate chip cookie recipe AND an awesome brownie recipe, so why don't I just experiment with those and make my own?!! DUH!! Thus a beautiful union was formed and my Cookie Brownies were born! Oooh they are tasty little morsels that are so easy to make! They do disappear almost as quickly as they appear so be warned! Hide them before anyone realizes what you've done!! There's no shame in that!! Prepare The Ultimate Chocolate Chip Cookie dough as directed and set aside. Prepare my Easy One Bowl Brownies as directed and set aside. Preheat oven to 375 degrees F., and grease and flour mini muffin pans. This will make approximately 48 Cookie Brownies. 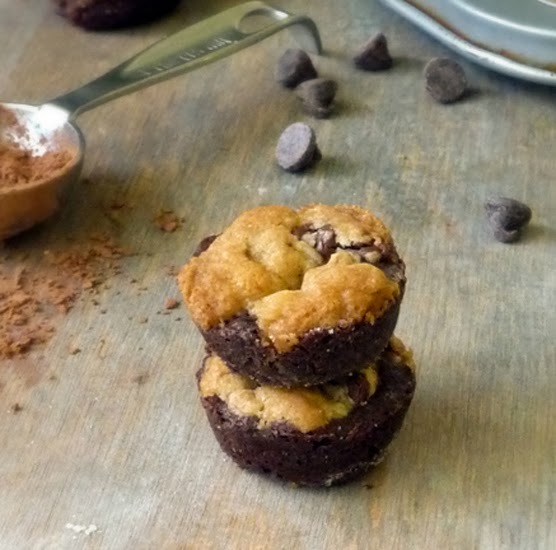 Using the brownie batter first, fill each mini muffin cup 1/2 way with brownie batter (about a 1/2 tablespoon each). 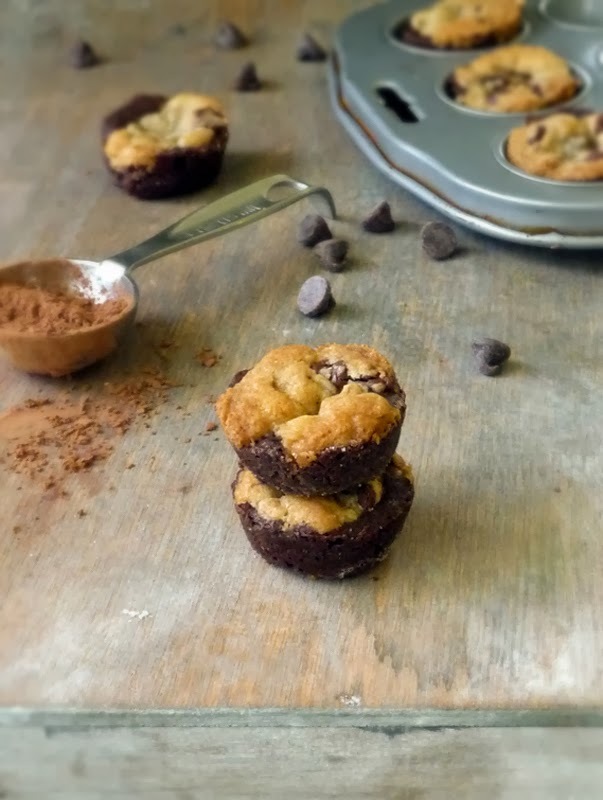 Add a teaspoon of cookie dough on top of the brownie batter in each muffin cup. You will have more cookie dough than brownie batter, so you can make chocolate chip cookies too! Bonus! Bake for 8-10 minutes until the cookie is nicely browned on top. OMG....beautiful!! Two treats in one! Perfect! Pure decadence! Yum! I'm going to have to try these! G'day! I could so go for a cookie brownie right now! YUM! How cute!